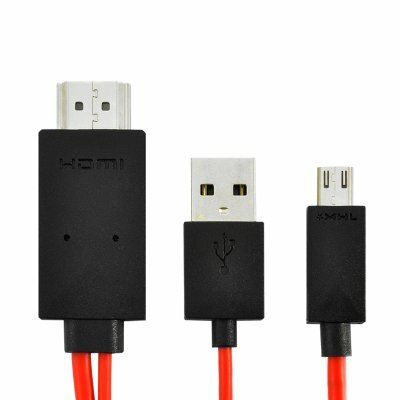 Successfully Added HDMI Cable for Galaxy S3 - USB Charging to your Shopping Cart. HDMI cable for the Samsung Galaxy S3 with an extra USB connection to keep your phone charged whilst in use for an easy way to connect and charge your phone. This HDMI cable for your Samsung Galaxy S3 is the ideal companion for your phone! The cable gives you instant HD viewing from your Galaxy S3 to an HDTV simply by plugging the cable from your phone to your HD TV for instant movies, pictures and music on a high def screen. This HDMI cable also comes with a very useful USB connector to keep your Samsung Galaxy S3 charged whilst in use! Purchase this new HDMI cable and watch what you want, where you want and when you want! Offered at the usual Chinavasion low wholesale price, it is in stock now and available for single piece or bulk orders from the leader in wholesale Phone accessories, Chinavasion. The "Samshung Galaxy S3" is a trademark of Samsung Group and registered in the U.S. and other countries. This is not claimed to be an authorized or branded product by Samsung Group although it is compatible. This product and our company are not affiliated with Samsung Group or endorsed by them in any way.